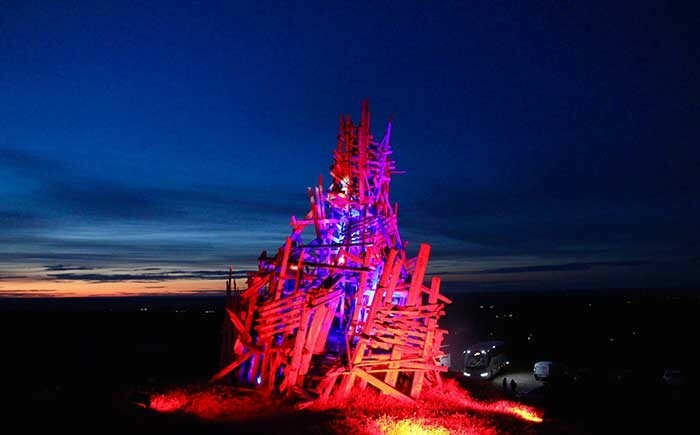 Sweden – On one of the brightest nights of the year in Kumla, Sweden, lighting designer Fredrik Jönsson showcased an amazing, drama-filled light show using products from the SGM P-family. 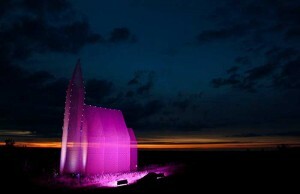 The show took place on a man-made hill, with smoke pouring from the ground, complementing the spectacular artistic light show on this bright summer night. The light show took place during a big gala dinner during a world leadership conference. 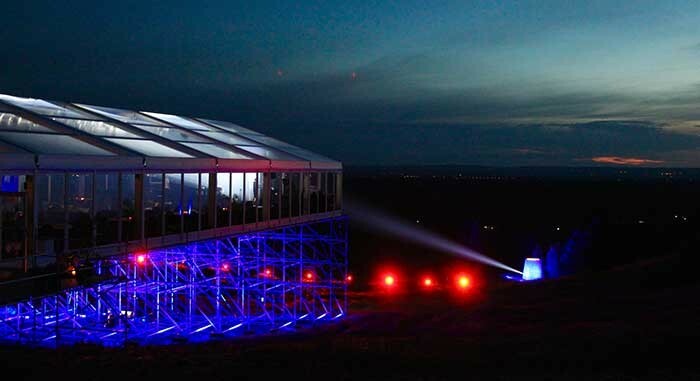 It did not take long to choose the man-made hill, as it was the highest point for miles and with an already fixed art-installation with large outdoor installations called “Art on the Hill.” With a concept of dining at a very scenic place, the event company Bright Blue decided to build a huge tent with see through sides and roof on a scaffold construction on top of the peak. Kvarntorpshögen was made during World War II, when extracting oil from slate. Although the oil extraction ended immediately after WWII, the hill is now a hot area, and Sulphur and smoke still pours from the ground in some areas. With these special surroundings, a light show here called upon both drama and a storyboard to make it alive. 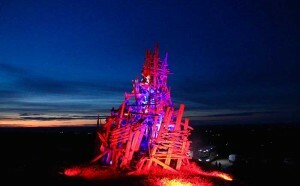 “My synopsis for the light show was that the art-installation wakes up during the night and greets guests with colour and lights, and ends with an up-tempo colour explosion where the installations dance,” said Jönsson, the designer behind a spectacular five-minute light show on Kvarntorpshögen. 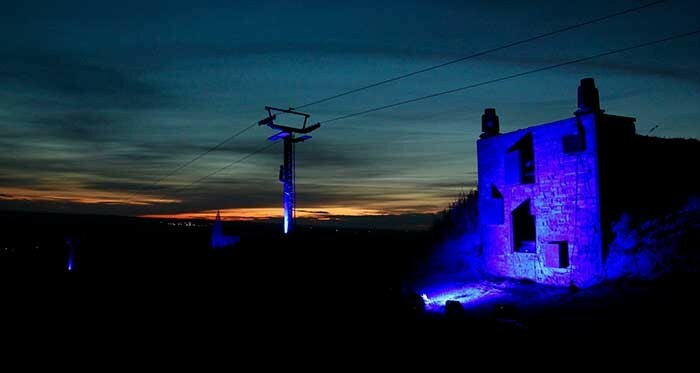 The task of distributing power and signal around the hillside was immense, and lights were scattered almost everywhere on the hill, even inside some of the art installations. To get the exact dramatic effect needed for the show, Jönsson knew what he needed. “I needed a big bunch of IP-classed fixtures with as much punch as possible, and they had to be sturdy enough to withstand the elements. Bear in mind that this was during a bright summer night in Sweden, one of our brightest times of the year,” said Jönsson whose passion for light started already in the sixth grade. With a bunch of SGM luminaires including the P-1, P-2, P-5 and SixPack, Jönsson and his team were able to get enough punch to deliver a spectacular show to delegates from 63 countries, who were all blown away by the immense lighting on this unique site. Working with lights since the '80s, Jönsson has truly experienced the great evolution from tungsten to LED lights. “I wouldn’t say that everything has become easier, modern stuff is so much more complicated, but gives you a lot of freedom and possibilities, which is very inspiring,” concluded Jönsson, who is celebrating 30 years as a lighting professional in 2018.